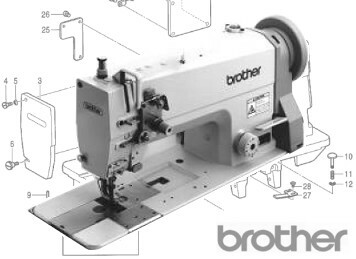 BROTHER LS2-B877 Full Walking Foot & Needle Feed Lockstitch Machine with Large Capacity Rotary Hook. Used by UPHOLSTERERS, COVER & TARPAULIN Makers, Bag & Case Manufacturers etc. We hold from stock all High Mortality Replacement Parts for this machine here in LIVERPOOL for despatch today. 'We Are The Parts People' What Can We Do For you?